Submitted by jerryl on Wed, 07/12/2006 - 19:03. Submitted by Claus on Mon, 07/17/2006 - 22:55. 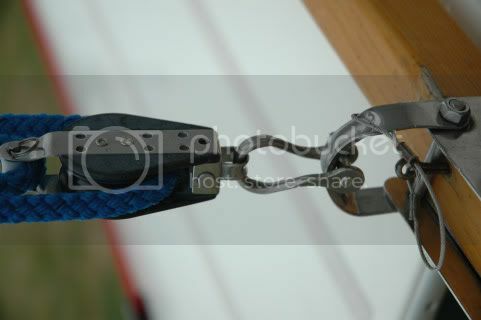 [i]Originally posted by jerryl[/i] [br]Why does it make a difference whether the shackle is up or down? If you look at the first picture (the incorrect picture) You see that the block can wonder along the shackle. 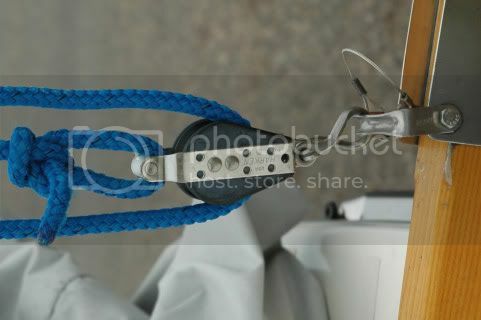 When this happens the block may be stuck at a bad angle and the tention from the mainsheet might not let it slide back. In the correct way the block can't stard wondering since it is prevented by the two sides through which the shackles bolt goes through. I hope that makes sense.